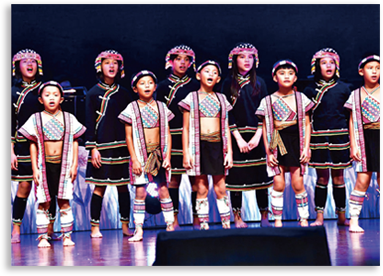 Located in Dili Village of Nantou County, Dili Elementary School students are participants in the Vox Nativa Children’s Choir. A renowned indigenous mountain village, Dili belongs to the Bunun tribe; a people renowned as pure and kind-hearted folk. With resonant voices, when performing the Pasibutbut, the world famous eight-part polyphony, the children of Dili reveal heavenly voices, as pure as crystal clear spring water. Though they have had no formal musical tuition, organization or conductor, they rely on the elder kids teaching their younger brothers and sisters. The school principal is also enthusiastic about leading the choir. Despite their shyness, the children of Dili always sing in a majestic manner. 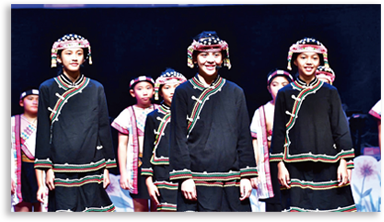 With a natural passion for singing, when they are dressed in their traditional costumes, it is as if every cell of the children’s bodies has been awakened to perform. The Supreme Master Ching Hai once remarked that indigenous people are God’s beloved people. No matter what their material conditions are, they are always pure and rich in the heart, and so joyful; that’s why they are very close to God. Dili children sing with innocent and natural voices. Their purity and happiness will definitely strike a chord in the audience’s souls.